Inventory We are a resale marketplace, not a box office or venue. Ticket prices may exceed face value. This site is not owned by Royal Farms Arena . The Royal Farms Arena (formerly Baltimore Arena, 1st Mariner Arena, and Baltimore Civic Center) is an arena located in Baltimore, Maryland. In 2003, it was renamed by 1st Mariner Bank, which purchased naming rights to the arena for 10 years. It was reported that 1st Mariner Bank will need to pay the city $75,000 for the next ten years to keep the naming rights to the complex. 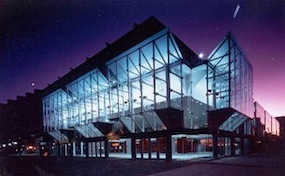 1st Mariner Bank Arena is located about a block away from the Baltimore Convention Center on the corner of Baltimore Street and Hopkins Place it is also only a short distance from the Inner Harbor. It seats up to approximately 14,000 people though this number varies depending on the type of event. On May 15, 2007, The Baltimore Sun reported that the feasibility study that was started in 2004 had been released publicly and the study stated that the current arena has "served its useful life" and that Baltimore must build a new arena or face the risk of losing events. The study rejected a proposal to repair the arena's aging systems, citing an estimated cost of $60 million, and instead suggested that the city demolish Baltimore Arena and build a new arena on the same site or elsewhere in Baltimore. Notably the proposed new arena would only seat 15,000 - 16,000 people the study assumed that Baltimore would never be successful in attracting an NHL or NBA team in the future, either of which would require a minimum of 18,000 - 20,000 seats; however, city officials were still open to this idea. Conceivably, the new arena could be successful in attracting an arena football team and/or a minor league hockey team, bringing more than 200 new jobs and generating up to $1 million in additional tax revenue. ArenaBaltimore.com is not a primary vendor, supplier, or affiliated with any official website. We proudly provide access to a large supply and low prices online for all secondary market events. Ticket prices may be well below or above face value and will fluctuate with the market. To purchase tickets for all Royal Farms Arena Events simply click on the show of interest or call our operators at anytime.